Companies are increasingly putting training at the centre of their efforts to develop and retain employees, rather than investing in training only when hiring new people or running courses for leaders. If training is targeted and delivered well it can boost company loyalty and improve staff retention, as well as improving performance and boosting motivation. 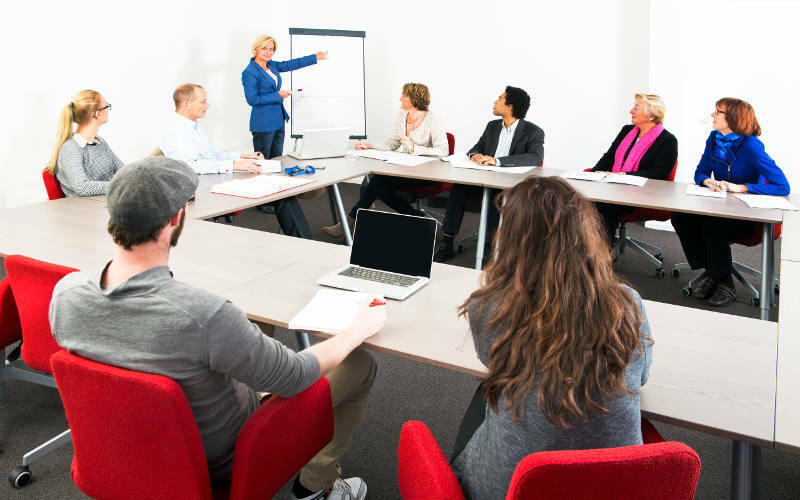 Training can also be used to ensure that staff understand the company’s values and mission statement. Crucially, training can be used to fill in skill gaps, particularly in areas that are constantly changing, like technology and marketing. It can also be useful when negotiating changes in the business, for example, when introducing new processes or systems. Every employee should have a professional development plan to help them focus on their careers, identify gaps in their knowledge and skills and to find the most relevant training courses. Corporate training has come on in leaps and bounds over the past few years, mainly because of technology. Many of the best corporate training programs deliver training in several different ways: blended learning (mixing online with face-to-face learning); collaborative platforms; webinars and Massive Open Online Courses (MOOCs), accessible short courses delivered to large numbers of learners online. People learn better and quicker when they interact with one another. Audience Response Systems (ARS) from Clikapad can help here. An ARS is a handheld keypad, about the size of a credit card, that allows individuals to respond anonymously and quickly with the press of a button. You can press buttons between 0 to 10 and answer multiple choice questions, take part in quizzes or vote. You can use the system to find out which subject areas your audience is most interested in or confused by, to check levels of understanding before and after training and to pitch training at the right level. Results can be shown instantly and embedded on a graph or chart in PowerPoint. The data can be collected on an Excel spreadsheet and analysed later in the office. Social media has become an integral part of most people’s lives and it can be used to augment both online and face-to-face training sessions. You can start a discussion on LinkedIn, share tips, views, problems and possible solutions. Trainers can set up an open or closed Facebook group where students can discuss issues, ask course-related questions or share relevant information. Twitter can also connect course students or people who attended a particular event, using a hashtag (#) to categories tweets and make them easier to find, such as #SussexSEOConvention. It can be hard on an audience if they are listening to a monologue from a trainer all day. Mix up your methods and techniques and don’t just make the session an information dump. A trusty PowerPoint presentation used right can be effective, as can strategic tea and coffee breaks. Using audience response systems on training days are another effective way to get people enthusiastic and involved. Break out into smaller groups for discussion, practical learning and idea sharing. You could set your groups a real-life problem the company faces and ask them to work on it together. Mixing up workplace teams is a good idea to build understanding between teams and to share knowledge. Think about the best way to deliver your training: online or offline or a mix of both. The popularity of mobile learning, using smartphones, is growing and works best when lessons are divided up into blocks of under 10 minutes long, tailored to short attention spans on phones. You could also put up a training video on YouTube or Facebook.